A stone’s throw from the beautiful Meia Praia beach & the historic town of Lagos, this apartment promises to be your home away from home! The apartment is great for couples and families. 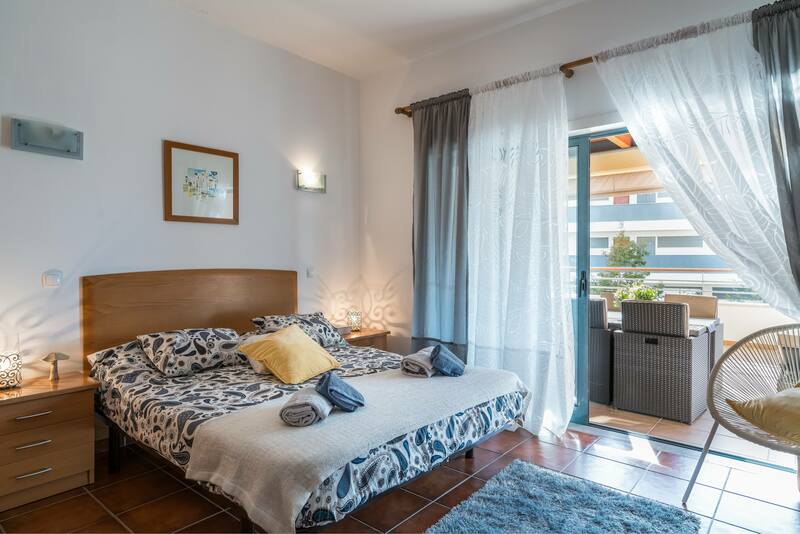 The apartment has 2 bedrooms (1 en suite) with a kitchen and large living area, fully air-conditioned for the long summer Algarvian sun and accommodates up to 6 guests. The apartment also boasts of a large terrace / veranda to soak up the sun without having to leave the comforts of your own home. Built within a large complex with its own swimming pool, tennis courts, children’s play area and onsite parking; this is the perfect place to soak some sun and make the most out of your relaxing holiday. The large living space is divided into the dining area with a dining table and a living area, with a large sofa bed. The space consists of a wide screen TV, telephone and wireless internet. There are two bedrooms in the apartment – an en suite double bedroom with access to the terrace / veranda; and a second bedroom with twin beds. The sofa in the living area can be converted to a double bed, should the need arise. There is a large kitchen with its own dining area, and comes fully equipped with electric hobs, fan oven, fridge-freezer, dishwasher, washing machine, toaster and a coffee machine, to make the most out of your time trying out some local recipes. Don’t forget to check out the fish market in the town centre! The apartment boasts a large terrace / veranda in addition to the living space within the apartment. It comes with an outdoor dining table and plenty of Algarvian sun to enjoy all the recipes you may decide to try out. If it does get too hot, you also have the option to bring down the canvas to keep the sun out. The apartment is located in the Marina Park complex in Lagos (Algarve), Portugal. The complex has its own swimming pool, tennis courts, children’s play area and on-site / private parking with easy access; this is the perfect place to soak some sun and make the most out of your relaxing holiday. Lagos is rich & historic town and it is easy to walk almost everywhere.